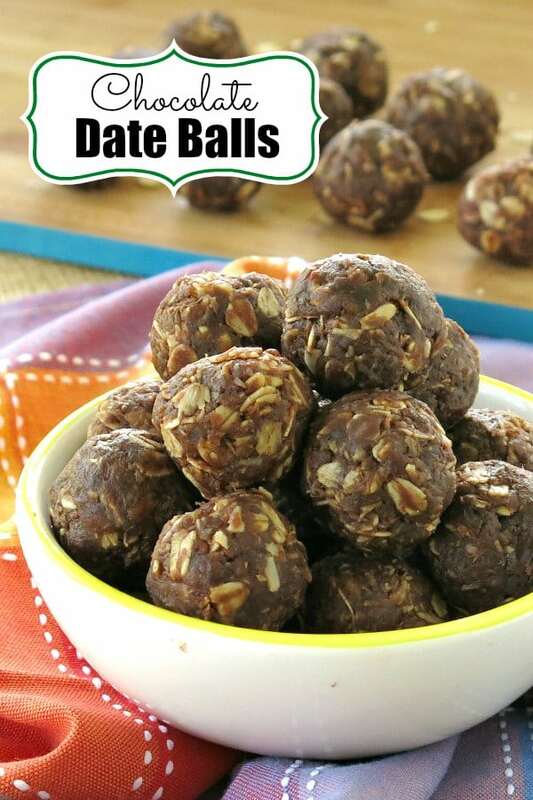 Chocolate Date Balls are sweetened with medjool date paste so they’re free from refined sugar. This easy, no-bake recipe with almond butter, oatmeal, coconut flakes, and cocoa powder has just 6 ingredients and takes about 15 minutes to prepare! 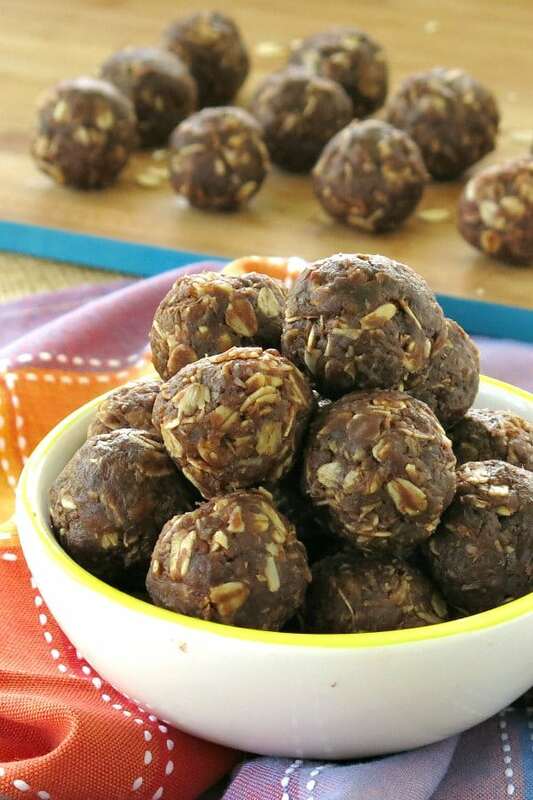 We’re obsessed with this variation of Energy Balls with Medjool Dates. Instead of using chocolate chips to get our chocolate fix, we used antioxidant-rich cocoa powder. They’re equally tasty and perfect for those times you need a mid-morning snack or a sweet treat that’s actually healthy. Don’t let the process of making date paste scare you away from making these Chocolate Date Balls. It’s really easy to make and will open a whole new world of sweet treats. These dates have a deep caramel taste that definitely satisfies a craving. We usually buy Medjool dates with the pit removed. If you need to remove the pit, lay the date on a flat surface and make a slit down the top, without slicing all the way through. Gently pull the sides of the slit open to expose the pit and pull it out. Easy! To make this recipe, we used 8 Medjool dates. Once you get a feel for the sweetness of dates, adjust it up or down according to your taste preference. Soften the dates a little, by placing them in hot water for about 10 minutes. 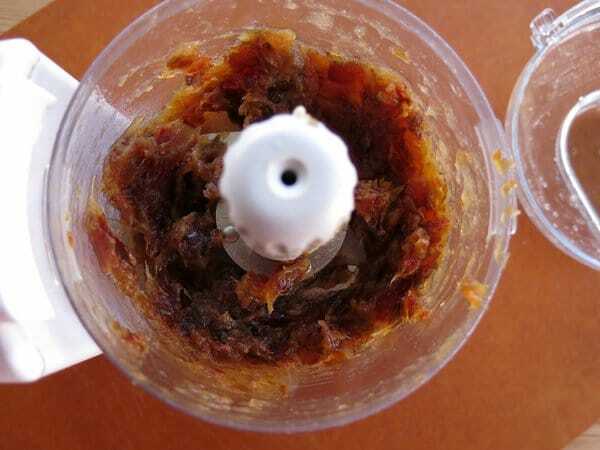 Next, remove the Medjool dates to a small food processor. Add a little water from the container that they soaked in too. Start with 1 Tablespoon and add a little more if necessary after you start processing. Oatmeal – use a gluten-free brand if necessary. 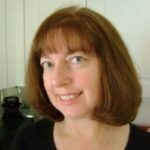 Cocoa powder – use an unsweetened brand. Dark chocolate cocoa powder is even better! Coconut flakes – use unsweetened flakes to limit the amount of added sugar. Almond butter – any nut butter or sunflower seed butter will work. Medjool date paste made from the process described above. It’s best to combine the dry ingredients and then add in the wet ones. “Cream” the wet ingredients into the dry ones. It takes a little arm work but you want to ensure that all the ingredients are evenly distributed. When you’re done, roll the dough into tablespoon-sized balls. Of course, you can always make them smaller or larger too. 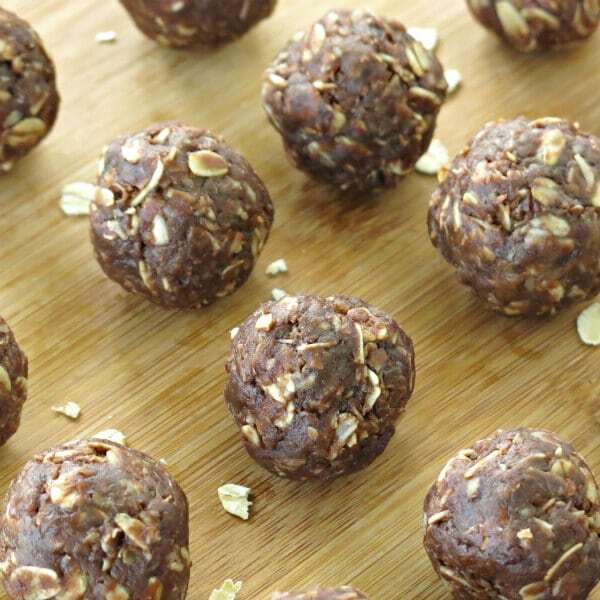 If you’re looking to up the protein a little more, then roll the Chocolate Date Balls in crushed almonds! Try our Carrot Cake Balls which also use Medjool Dates for a complete different flavor profile! Please rate this recipe and tag @DinnerMom or #DinnerMom on social media. We love to see what you’re cooking up! 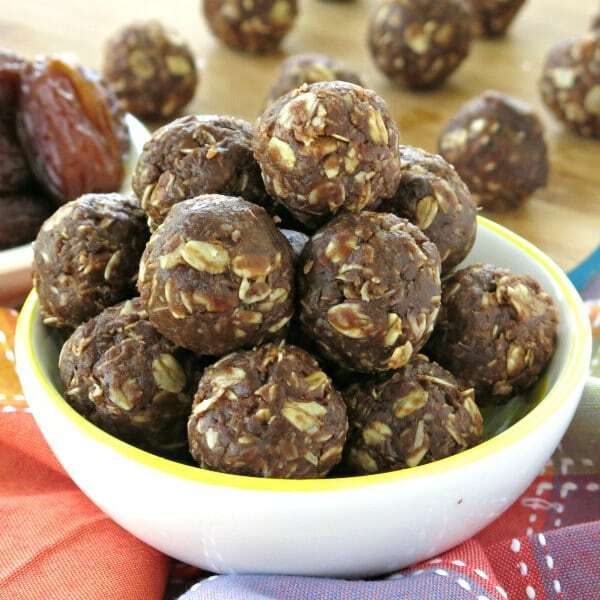 Chocolate Date Balls are sweetened with medjool date paste so they're free from refined sugar. Easy, no-bake, vegan recipe with just 6 ingredients! Add dates to water, cover with plastic wrap and set aside for 5-10 minutes. This softens the dates and makes them easier to puree. It's not necessary if the dates are very soft. I love that these only use a few simple (and healthy!) ingredients and are so easy to make. Perfect for a little afternoon energy boost! Yes! The easier the better! Oh, yum! These are FABULOUS! Perfect for that little sweet something I need mid-afternoon without all the guilt! Excited to try this! My daughter is super picky about chunks. Do you think I could purée everything together (like oats, coconut and everything else)? Or would they not hold together? Thank you! I have not tried this, but, I do think it would work! Let us know! Delicious! I only made one change….I whirled the oats in the food processor so I wouldn’t have large chunks of oats…my granddaughter wouldn’t have even tried them if she saw them. It worked! That’s fantastic! Thanks for the tip! Wow so easy and delicious yum yum! !